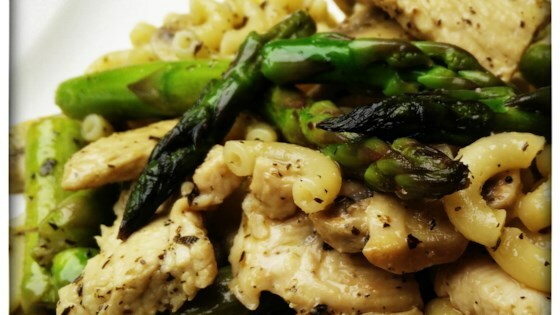 "Chicken, asparagus, and mushrooms are sauteed in a garlic and olive oil base. You can add more mushrooms if desired. Serve with rice or pasta, and a glass of white wine!!!" Melt the butter with the olive oil in a skillet over medium-high; stir the parsley, basil, oregano, garlic, salt, lemon juice, and wine into the butter mixture. Add the chicken; cook and stir until the chicken is browned, about 3 minutes. Reduce heat to medium; cook, stirring occasionally, until the chicken is no longer pink inside, about 10 more minutes. Add the asparagus; cook and stir until the asparagus is bright green and just starting to become tender, about 3 minutes. Stir in the mushrooms and cook an additional 3 minutes to let the mushrooms release their juice. Serve hot. I made a few modifcations - onion instead of garlic, subbed olive oil for butter and upped the cooking wine and mushrooms. It was exactly what I wanted. Light and tastey and perfect for spring. This is a very tasty dish, however anytime I see lemon butter and white wine I usually add capers. Will definitely do this again. This is a great and awesomely easy recipe. I added a variety of veggies, like snow peas, red peppers, and onions. It was delicious! This dish was delicious with just the right amount of seasoning to keep it light. I made it without the wine however (non on hand) and just topped with some parmesan cheese. Will keep this one!